Holy Sh!t. They are afraid. Keep it up guys and gals. We The People. Twitter to tell 677,000 users they were had by the Russians. Some signs show the problem continues. Why am i not surprised that WaPo doesn't know the difference between patriots and russian bots and on top of that #releasethememo is still trending. Holy Smokes, we're up to 286 pages on this thread!!! Desperate propaganda effort under way. All will come tumbling down soon. 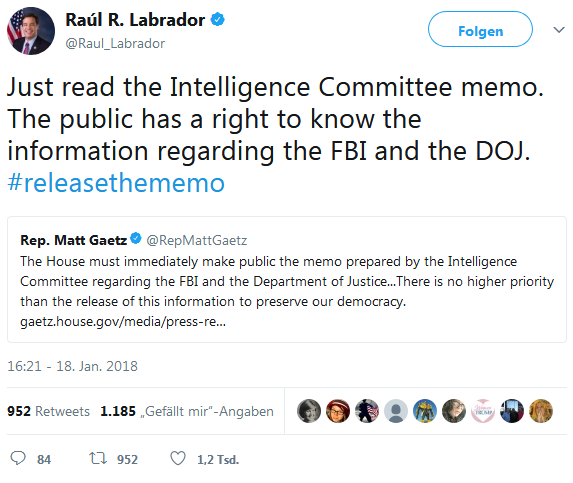 The memo will be released. I think they are just building up exposure at this point. Probably early next week. The Republicans have the unique opportunity to show the Democrats how it is done the legal way. Schiffty already leaked the memo to two bias news outlets to get ahead of the scandal. I will cheer when he gets cuffed and taken away. It's clear that he is working against POTUS and serves Obama and HRC only.